On August 10, the National Day of Action will take place throughout Brazil. All labour federations called it for jobs, social security and labor rights. The orientation for the day is for prepare strikes in the most diverse sectors, protests and public demonstrations throughout the country, bringing together city and rural workers, students, popular movements and groups against oppressions. CSP-Conlutas joins the unit in action to build the fight against unemployment and for the reduction fuel and cooking gas prices, and in defense of workers’ demands and rights. It will be a day to say enough is enough to the attacks of governments and bosses. We will be on the streets in defense of jobs and rights ; for the repeal of the Labor and Social Security reforms and the outsourcing law ; the end of Petrobras fuel prices policy ; to say no to the privatization of Petrobras, Eletrobras and other state-owned companies and to say no to the sale of Embraer to Boeing. We are fighting for the repeal of the “spending cap” bill and against the government’s austerity policies ; against the criminalization of the struggles and the end of the genocide in the peripheries ; to demand the suspension of the payment of the Public Debt to the bankers. 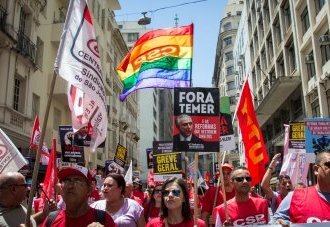 For a General Strike, down with Temer administration and all the corrupt national parliament !